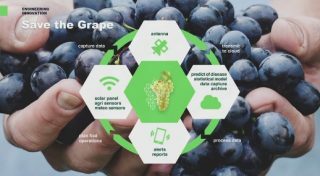 The collaboration between Engineering and the Maison Anselmet winery shows how Big Data Analysis supports the decision-making processes of those who operate in the Agri-food sector. “The more data, the better”. The summary of the opportunities of precision agriculture is in this sentence pronounced by Giorgio Alselmet during the Kick Off 2019 presentation of the project Save the Grape, realized by Engineering in collaboration with the historic Val d’Aosta winery Maison Anselmet. Thanks to an infrastructure of sensors positioned in the oldest vineyard of the winery, capable of collecting real-time data on climate and soil conditions and of forwarding these to a cloud platform for analysis, agronomists are able to make precise and optimized daily decisions based on specific irrigation and plant health treatment needs. “I immediately believed in this opportunity – Anselmet states – because being able to consult reliable data allows us to overcome the daily challenge against fungal diseases which are increasingly insidious, also as a result of climate change. Our work is based on personal experience, but having reliable data available allows us not only to better manage critical issues, but also to reduce the use of treatments, maintaining healthier vines, with a better management of irrigation in order to produce higher quality wines and to ensure a greater environmental sustainability”. The data which can be analyzed through the sensors installed in the vineyard are those which refer to soil conditions and microclimatic variations, to wind, humidity and water resources: once processed, the information is made available on a simple dashboard and through a reporting system, thereby allowing an improved control of chemical treatments and irrigation. “The number of treatments – Anselmet recounts – has been reduced by 50%, from eight to four, also thanks to the fact that those carried out were planned on the basis of the most suitable soil conditions, with the most correct temperature and humidity levels detected by the sensors”. Thanks to Save the Grape it is possible to monitor all the activities of the vineyard and of the commercial farm, generating a more efficient management of raw materials consumption, for controlling production and automation systems, of management and integration of laboratory activities. “Quality control – continues Giorgio Anselmet – has been favored by the precise monitoring of the brightness and irradiation of the ultraviolet rays, fundamental for red wines, and of the atmospheric temperature range, which is decisive for white wines; this has also provided valuable indications for planning vineyard points where we can think about producing individual wines, right up to planting the different vine varieties. Last but not least, thanks to the possibility of establishing the water supply and management with precise objectives, in our specific case we were able to carry out a single irrigation during foliation, deliberately depriving the plant of water in order to favor the re-growth of the roots searching for water resources. This allowed us to achieve the precise goal of giving a greater intensity of aromas and fragrances to the final product“. By analyzing the intensity of the color of the leaves captured on images taken by drones, it will then be possible to determine the amount of chlorophyll and the state of health and maturity of the plant, favoring the identification of the best harvesting time. What are the possible developments? Advantages for the entire wine sector could be had from the adoption of the project over larger territories, with the possibility of sharing some data and results which would favor not only building up a network of producers, but also increasing the quality of the products. “For over a decade – stated Francesco Bonfiglio, Managing Director of Engineering D.HUB – we have been witnessing a trend which has seen food technology break away from the real world in favor of an unhealthy immersion into the virtual one, and I am pleased to underline how, starting from a context where the relationship between man and environment is closer and healthier such as in agriculture, we can instead clarify that it is time to feed the reverse phenomenon. A phenomenon where digital information generated by sensors, IoT applications, data analytics, brings man closer to the environment and to nature once again, consolidating a healthier and more constructive relationship“.